Allotments have been with us for many hundreds of years, possibly as far back as Anglo-Saxon times. But it wasn’t until the 19th century that they began to be used in the way we recognise today. At this point land was allotted to the working poor in the countryside so that they could grow food, while in urban areas the relatively well-off used allotments as a way to escape city life. In the late-1900s the Small Holdings and Allotments Act came into force, making local authorities responsible for provision of allotments according to demand. As the First World War progressed, it became apparent that Britain could no longer reply on imports of food from other countries, as the ships transporting them became frequent torpedo targets for German ships and u-boats. This led to a rise in the number of allotments, as local authorities allowed derelict land to be used for growing food. The Board of Agriculture and the War Agricultural Committee were involved in helping to acquire land, although the final decision laid with the parish councils. As early as September 1914, parish council minutes show that the Board of Agriculture and Fisheries was encouraging the residents of Pencoed to cultivate gardens and allotments (Pencoed Parish Council, minute book, P131/1/2). One option favoured by the Board was the use of land near roads and railways for allotments. At Llandaff railway station, for example, land was acquired near the station and the station’s hotel (Whitchurch Parish Council, minute book, P6/64). By 1917 even this was not considered enough. In Pontyclun and Talygarn, it was recommended that the church ground be used as gardens (Pontyclun and Talygarn Parish, vestry minute book, P205CW/33). One problem the local authorities faced was that not everyone who had land that could be cultivated would willingly give it up for use as allotments. In Newcastle Parish, Bridgend, the parish council reported that a Mr Thomas repeatedly refused to give up his land, despite the local authorities pointing out to him that they had the right to purchase his land in a compulsory manner if necessary (Newcastle Parish Council, minute book, P84/15). Another issue that surfaced was the unsuitability of some land for crop growing. 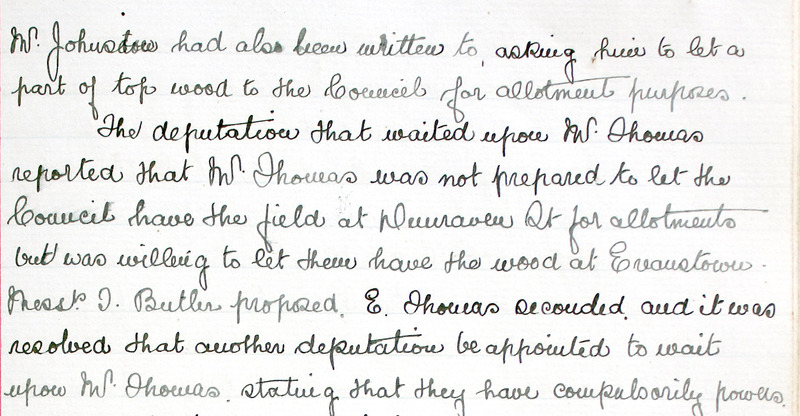 In Tythegston the parish council made it clear that ‘unless the allotments were allowed to be where the Surveyor had pegged out the ground that they would have nothing to do with them’ (Tythegston Parish Council, minute book, P88/2). It would appear that the processing of applications to Glamorgan County Council by the parish councils for use of land as allotments took some time. In one instance, this led the Ynysawdre parish to contact the Dunraven estate to see if they could offer land instead (Ynysawdre Parish Council, minute book, P129/2/3). 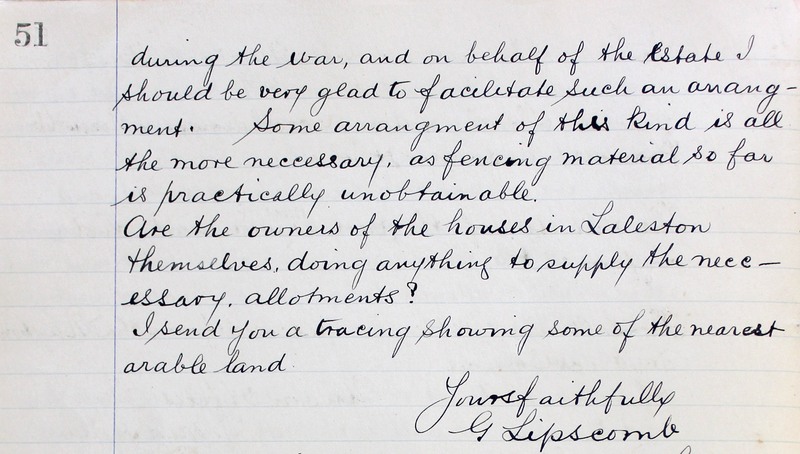 But even the Estates were not always willing for their land to be used, as the parish of Laleston discovered (Laleston Parish Council, minute book, P81/7/1). The local authorities tried to help those who had allotments, giving advice on a variety of issues. 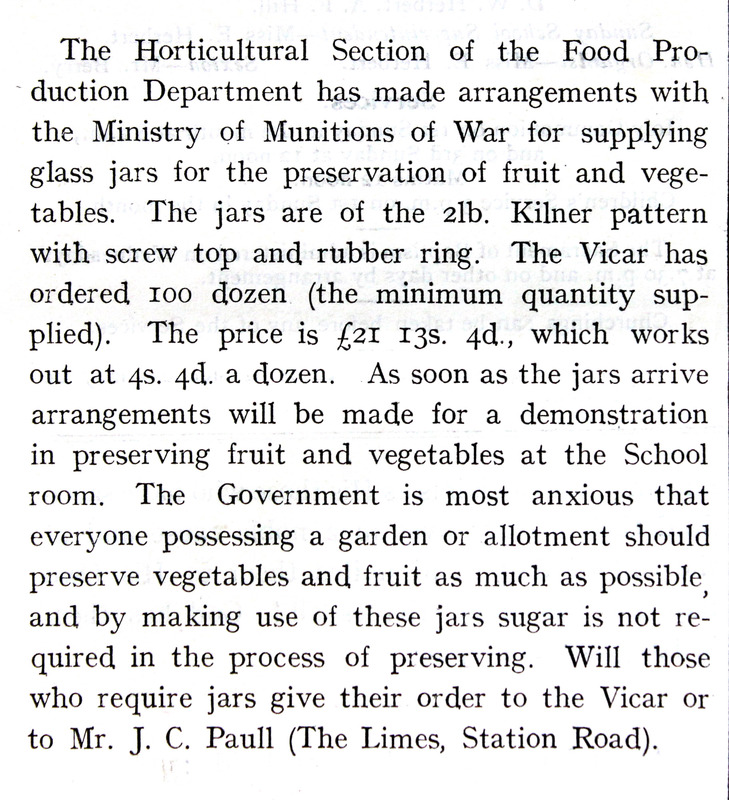 Llanishen parish council advised gardeners to put fruit and vegetables in Kilner jars, as this would mean they would not have to use sugar to preserve them (Llanishen Parish, parish magazine, P55CW/61/31). In Llancarfan the War Agricultural Committee asked the parish council to secure seed potatoes for allotment farmers (Llancarfan Parish Council, minute book, P36/11), although in Rhigos the Glamorgan County Council Agricultural Committee canvassed allotment farmers to invest in the potato seeds (Rhigos Parish Council, minute book, P241/2/1). Those who grew potatoes were encouraged to spray them to prevent disease (Newcastle Parish Council, minute book, P84/20). Once the war was over, interest in allotments declined. Some land returned to its previous state, or was put to other use. But one problem remained. 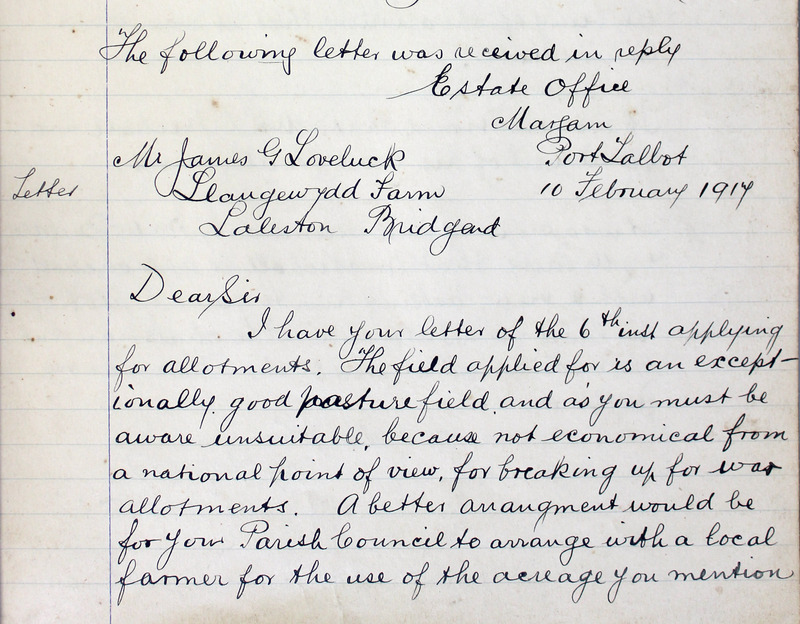 Some of the fields used for cricket had been converted to allotments during the war, such as the one at St Fagans Road, Ely (Llandaff Parish Council, minute book, P53/30/5). When the cricketers returned ho me after the war and wished to play again, they found that some of their playing grounds were out of use. Many of the remaining fields were in demand, which meant that finding a vacant field for a game was very near impossible (Roath Parish, parish magazine, P57CW/72/10).